Welcome to our Best Bars series, seeking out the finest drinking establishments across all of London. Rum is for more than just being mixed with coke or muddled with mint. Whether you’re a connoisseur or keen to get more acquainted with Jack Sparrow’s favourite spirit, here’s our pick of the very best places to drink rum in the capital. This playful homage to all things Caribbean might not take itself too seriously, but its rum list means business. Not so much a back bar as a wall cladding, the number of bottles of different rums here heads well into the hundreds with an ever-changing and growing selection. In fact, it claims to have the largest selection in the UK. Thanks to the chilled out vibes that radiate from the bar, you could even pretend you’re in the Caribbean if you try hard enough. A good few doses of rum will help with that. You'll find Cottons on Exmouth Market and on Curtain Road in Shoreditch. Counting many celebs and younger members of the royal family among its regulars, Mayfair’s Mahiki is high on the list of places to be seen in the capital. Indeed, for a relentlessly tacky tiki bar, it takes itself a little bit too seriously for our liking. Still, fun drinks including the famed grog-filled treasure chests (around £150 a go, but will serve at least eight) and prices not too bad for the location (there are plenty of options for little more than a tenner) make it worth a drop-in if you like your rum with a bit of razzmatazz. So long as it’s not at a time when it decides to charge entrance, of course. 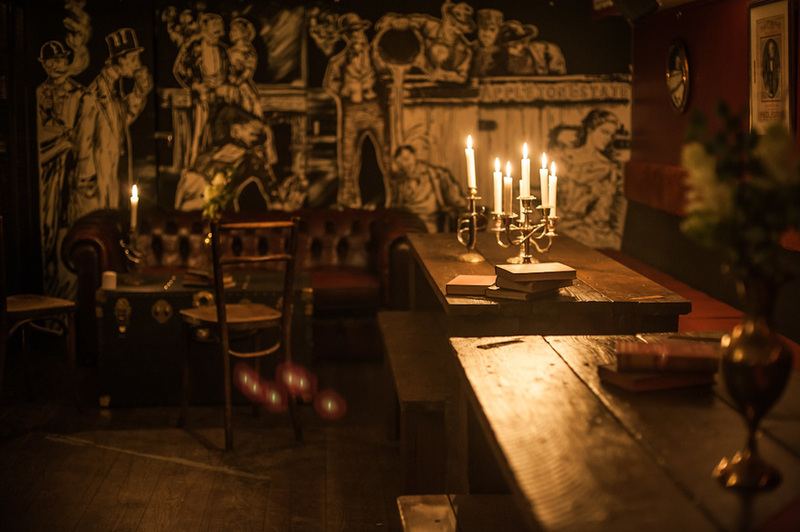 Hidden away under Off Broadway pub on Broadway Market, finding this teeny sailor’s speakeasy is all part of the challenge. Clue: you might have to spend a penny. Once inside, cosy-up on the leather sofas and please your inner pirate with classic and experimental rum cocktails that eschew the fruity and the tiki in favour of the strong. There’s also a hefty selection of rums to try neat if that’s your thing; a nice touch is that if you want to buy a bottle of something special, you can keep it on-site in a dedicated locker so that it’s there when you return. If you can find your way back, that is. Not only does this Docklands bar and restaurant stock over 100 different types of rum and know how to whip up just about any cocktail you could imagine with them, but it’s set in a converted warehouse that was originally used for storing rum that came off ships in London’s docks. More than just an atmospheric place to enjoy a few swigs, the bar also runs Rum School classes and rum and food matching events, which can be booked for groups of ten or more. The clue is in the title of these venues in Notting Hill and Soho. Despite being full-blown Caribbean restaurants, they are also top places to enjoy a tipple of the good stuff. From mojitos and mai tais to more creative numbers, there’s no shortage of well-made and well-priced cocktails, but it’s also worth moving on to the succinct selection of rums designed for sipping — a good introduction for those who aren’t sure what to go for and who might be flummoxed by a longer list. Before you get onto the neats, make sure you try Mama’s Guinness Punch, though: over-proof rum, condensed milk, Guinness, spices and chocolate bitters, mixed and served over ice. For more on the food, check out our full restaurant review. Hidden away in a Park Lane hotel, this bar has been pulling punters into its Polynesian lair for over 50 years. It’s an offshoot of the California original of the same name where Trader Vic himself is said to have first created the Mai Tai cocktail back in 1944, and the list offers many a take on this classic cocktail, including the original recipe as well as modernised versions. Just about every other rum punch or tiki drink you could imagine is also available, each served in its own delightfully tacky vessel. The whole space is styled as a beach bar so expect no subtlety whatsoever, but bar snacks such as sticky, slow-cooked ribs are surprisingly good. This kitsch and gaudy subterranean lair on Portobello Road can easily divide opinion, but it’s an absolute must-try all the same. It’s tiki all the way, so expect palm trees and cocktail umbrellas, but it’s tongue-in-cheek rather than genuinely trashy. The retro rum cocktails might seem playful, but this belies some serious quality spirits and standards. That most of the cocktails (sharing bowls aside) cost under a tenner is a big bonus, especially in this neck of the woods. Artesian: More than 50 rums are available in the glamorous hotel bar that's been voted the world's best.